Joseph de Maistre had no doubt that the root causes of the French Revolution were intellectual and ideological. The degeneration of its first immense hopes into the Reign of Terror was not the result of a ruthless competition for power or of prospects of war. He echoed Voltaire's boast that "books did it all." The philosophers of the Enlightenment were the architects of the new regimes; and the shadow between revolutionary idea and social reality could be traced directly to a fatal flaw in their thought.De Maistre asserts that society is the product, not of men's conscious decision, but of their instinctive makeup. Both history and primitive societies illustrate men's gravitation toward some form of communal life. Since government is in this sense natural, it can not legitimately be denied, revoked, or even disobeyed by the people. 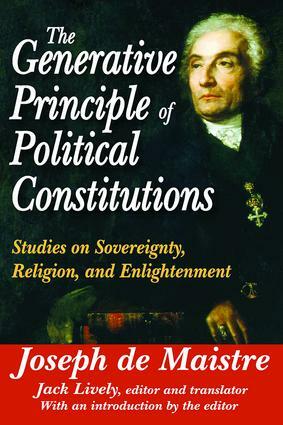 Sovereignty is not the product of the deliberation or the will of the people; it is a divinely bestowed authority fitted not to man's wishes but to his needs.The French Revolution to de Maistre's mind was little more than the expansion, conversion, pride, and consequent moral corruption of the philosophers. It differs in essence from all previous political revolutions, finding a parallel only in the biblical revolt against heaven. These sentiments are the passionate and awe-inspired language of one who sees the political struggles of his time on a huge and cosmic scale, judges events sub specie aeternitatis (under the aspect of eternity), and looks on revolution and counter-revolution as a battle for the soul of humanity. The force of this classic volume still resonates in present-day ideological struggles.